So much has been happening with the house since my last update. 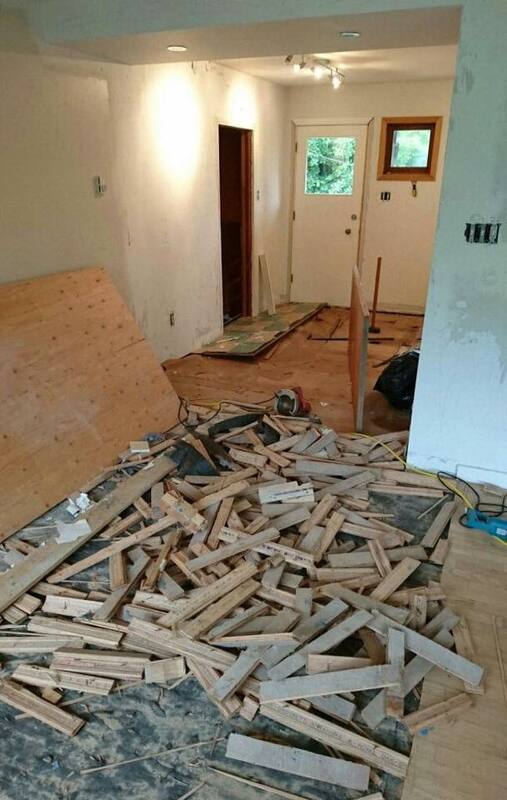 We've met with our general contractor (my uncle), several times. 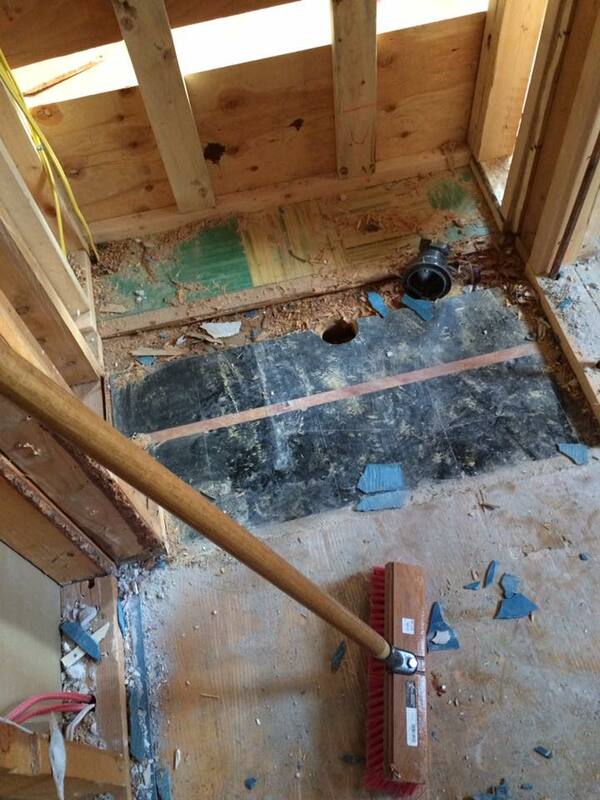 We've met with the plumber and electrician, and started spending $$ too. Here's a break down of what we have spent so far. This does not include any of our general contractor's labour, plumbing or electrical labour which will be the biggest expenses. 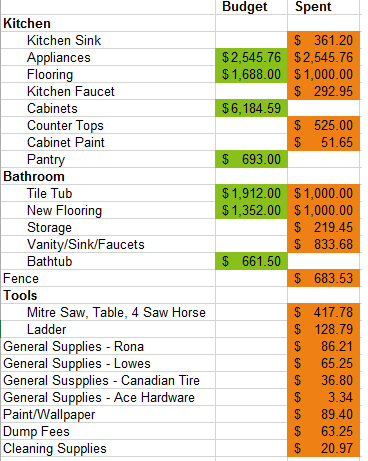 The green highlights are confirmed prices, and the orange is what has been actually spent. Some things just have deposits on them, which is why there is spending in both categories. Building in rural Canada isn't cheap, but it's going to be done well and we're excited about that. We're doing as much as we can too - to save $$. You know that Jordan and I have done all of the demo, and we're also doing all of the painting. We'll be painting our cabinet doors and trim too when the time comes. A week ago I had surgery on my right foot for my plantar facilities. The doctor had to re-injure the facia because it's no longer healing on its own, or with traditional solutions like physiotherapy and orthopedics. They stabbed my heel 40-50 times with a very thin needle, which should encourage my body to heal that and the other issues. On top of that, we also did a PRP injection. I linked to the Wiki if anyone is interested, but what they did was take a vile of my own blood and then shook it until it separated. They then injected the platelets back into my foot. The idea is that it speeds up healing. The hardest part this past week has been managing Little Man. He's not walking yet, but he sure is mobile with crawling and pulling himself up onto furniture. Not to mention he loves being picked up and carted around and cuddled. So he's been a bit fussy and cranky with having to be a bit more independent and at the same time, a bit more restricted with me using the exersaucer quite a bit more than we have before. One more week of zero weight baring and then I can gradually start using it again. Here's to counting down. It has been a busy couple of weeks since we started demolition of our kitchen and bathroom. Here's few photos to show you what we've been up to. 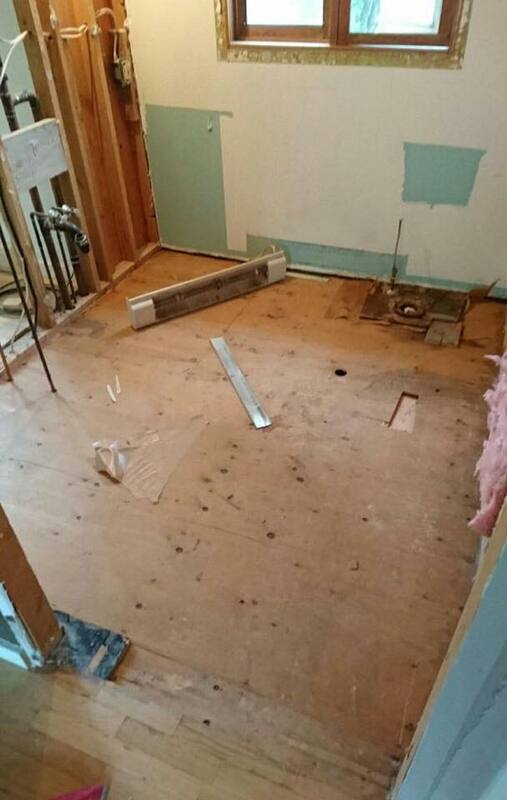 Bathroom - 3 Layers of Flooring! 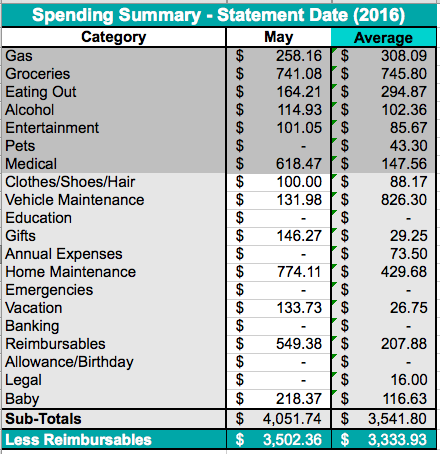 Here's the May spending report. Groceries was high, in part because of a Costco shopping run to stock the camper Pantry and top up some things here. Entertainment and gifts was higher partly because Jordan's family was in town for a visit so we had some extra expenses. Home Maintenance is in large part the fencing stuff for our dog run. Medical was from the appointments out of province. This includes meals, gas etc., and hotels for the trips. We'll be tracking this and submitting medical expenses on next years taxes. 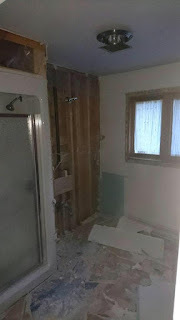 Today is possession day, so I thought I would share a few pre-renovation pictures of the kitchen and bathroom. It sure has been a busy month. I've been to Alberta twice for medical appointments, took Little Man for his first camping trip, and have been continuing to get quotes and budgeting for the renovations for the new house. We've been meeting with insurance brokers, mortgage brokers, the local credit union, and on and on. Some of my husband's family came to visit for a few days and that was a blast too. Busy, busy, busy. We've been watching for sales at the local hardware store, and got 15% off the fence package we're using for the dog run. I was pre-approved for the new Tangerine MasterCard, applied and timed my activation to coincide with our first purchase for the house. We have three months of 4% bonus cash back and I chose hardware stores, furniture stores, and grocery stores to capitalize on the reno expenses. I helped my mom start tracking her expenses. We set up a spreadsheet and she's now four months in to tracking. It's really fun helping someone else track things. June is going to be super hectic for us as well. We're planning to have the bathroom and kitchen renovated, the dog run built as well as a lot of yard work done. I also have foot surgery near the end of the month.